The Glamorous Life of a Housewife: Fishin' For Diapers. You may remember my post when Levi was merely 7 weeks old on The Great Diaper Debate. Each diaper, Pampers, Huggies and Luvs had it's pro's and con's to me, whether it be smell, feel, consistency, etc. Since then, I mainly used Luvs. They smelled the best by far, were easy to find, are the most affordable by a landslide and to this day Levi has never (I repeat NEVER) had a leak or a blow out in a Luvs. They are fabulous. I stopped dead in my tracks, grasped a package tightly and inspected each and every word. Fisher Price has DIAPERS?! This was a new one. Intriguing. So intriging, in fact, that I impulsively threw them into my cart, eager to give them a whirl. You are my newest love. You have special color coded straps to see if the diaper is too tight, too loose or just right! GENIUS! 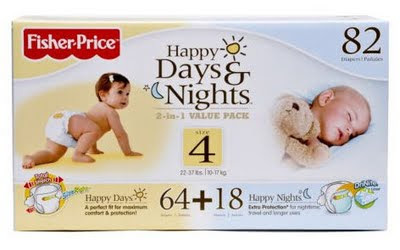 You have special Day and Night diapers, packaged in one! You are wonderfully made, with special leak protection. You have fun designs on you. You do not stink when tinkled in. You are durable, reliable and fantastical. 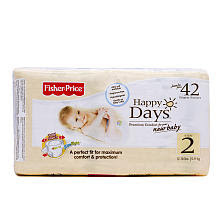 Anyone out there in Bloggy Land ever tried these diapers? If not, go out and get'cha some! They're amazing. Never tried FP. We had terrible luck with Luvs though. I was a Huggies (not supreme)girl until 4 weeks ago! Didn't know they had diapers either. Have you saw them any where besides BRU? I personally like Pampers. I have never really had the urge try any other brands. I am just too chicken! One thing I get so annoyed by is that I always get coupons for diapers (mainly Huggies) that I don't use. That's hilarious! I never knew Fisher Price made diapers, either!! I'm with you on the Luvs. We had leak issues with them when Cub was a wee one who had explosive diapers every other minute, so we switched to Pampers, but now that he is older, they're great!! Love love love the Luvs! I had no clue they existed! Awesome! I haven't seen these yet, but they sound like they are worth a shot! We are a pampers family ourselves. And we buy them buy the box load at BJ's Wholesale, so we're stocked up until Beanie goes to college. Interesting! I don't have a BRU near me so it wouldn't be affordable for me. How much were they in comparison to Huggies/Pampers/Luvs? I have never seen those. Baby products are so fun even diapers! they are not very cute just brown but I love that they don't use chlorine. With ya on the Luvs!! Hate Huggies! Have to try FP! Are you open to cloth? They save a lot of money, and are not as much of a hassle as most people think. We have never had a leak, and they are super-cute! For our family, cloth is the way to go and we wouldn't have it any other way. Oh I hope to find these in my area! I swear by the Fisher Price brand no matter what they make because everything I've ever bought for the boys with their tag on it was so darned sturdy. Where did you find these? I hate Luvs, I only use Huggies for my daughter. It's funny though because with my son we used only Luvs, and never had a leak! But my daughter leaks out of the Luvs like crazy. Let me know where you bought these I would love to try them.